Cousin Christy here, poppin’ in! I like to help out my family sometimes with some posts. I love tea and food and a good time so it makes sense that today I’m posting my boozy-tea creation. Enjoy! Sometimes, your afternoon tea party runs into 5 o’clock. The delicate properties of tea lend themselves quite well to being blended into cocktails! Today’s tea cocktail pays homage to the end of summer. David’s Tea has a wonderful tea that is only available for summer (so grab it while it’s still for sale!) called Cotton Candy. Above is a close up shot of the Rooibos blend. It is a very light and sweet (those ARE cotton candy sprinkles pictured above) tea that is really refreshing as an iced tea or, how David’s Tea refers to it, a Tea-Pop. A tea pop is made when you brew the tea with hot water for 4-7 minutes, pour over ice, and add equal parts carbonated water. If you have kids, just stop right at this step because this makes a fantastic healthy alternative to a sugary soda! If you have kids though, maybe you’ll want to save one glass of the tea pop for you and make it a tea cocktail. 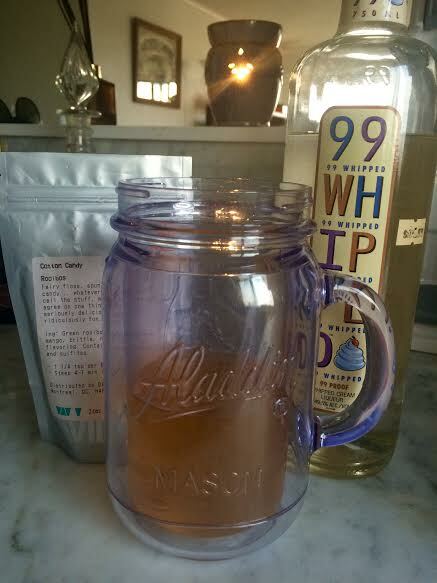 For an extra nostalgic twist, I added one ounce of 99 Whipped Vodka (pictured below) to 2 cups of Cotton Candy Tea-Pop. 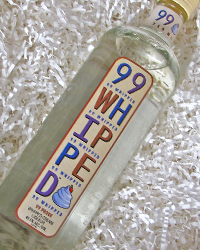 In my trials, I tried a regular vodka as well as a marshmallow vodka, but the 99 Whipped Cream gave me the best flavor. Feel free to add different liquors and leave a comment below to tell us how you liked it or how you mixed it up! Brew tea. David’s Tea suggests 204ºF for 4-7 minutes. Let tea cool and pour over ice, or use less hot water and pour over a full glass of ice. Add 1 ounce of Whipped Vodka. Sip and feel the summertime memories come bubbling back to you! Enjoy your summer fun tea cocktail! Found out a long time ago that Tea goes very well with booze. One of my favorites is a cup of Hot Tea (your choice) with a dollop of honey and a portion (strength determined by individual taste) of Scotch. Use the garden variety Scotch and save the better stuff for drinking neat as it is intended.